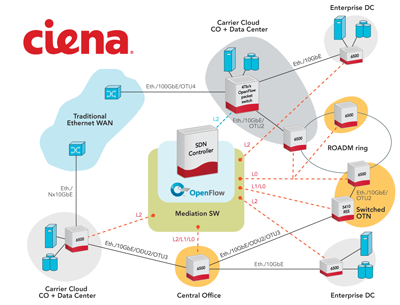 Ciena is collaborating with CANARIE, Internet2 and StarLight to build a software-defined wide-area network that leverages OpenFlow across both the packet and transport layers. The network features an open architecture carrier-scale controller and intrinsic multi-layer operation. The network initially connects Ciena’s corporate headquarters in Hanover, Maryland, USA with Ciena’s largest R&D center in Ottawa, Ontario, Canada. International connectivity is achieved with Internet2 through the StarLight International/National Communications Exchange in Chicago and CANARIE, Canada's national optical fiber based advanced R&E network. "Going above and beyond a simple testbed, this live, fully functional network will drive continued innovation and demonstrate how a truly OPn network architecture can unleash the full power of SDN in the WAN. By building the industry’s first fully-featured, fully-open and fully-operational, end-to-end and multi-layer SDN-powered WAN, we can offer a real-world experience for customers and researchers to trial, refine and prove SDN concepts and technologies in both the network and the back office – without having to build a unique infrastructure for every use case," stated Steve Alexander, senior vice president and chief technology officer at Ciena. Nokia Siemens Networks has changed its name to NSN, reflecting the change of ownership following Nokia’s acquisition of Siemens’ entire 50 percent stake, which has just been completed. Nokia Solutions and Networks is now wholly owned by Nokia. Rajeev Suri will continue as CEO and the NSN Executive Board will remain unchanged as a result of the transaction. The company is focused on the mobile broadband sector. Nokia plans to continue consolidation efforts. “While our name and brand have changed, I would like to emphasize that our overall strategy and our focus on mobile broadband remain the same,” said Rajeev Suri, CEO of NSN. “Our customers will not notice any difference in our unstinting commitment to delivering superior technology and services across the world. Today’s announcement is, however, an exciting new chapter in our transformation story." NSN also highlighted its improved financial standing, saying improved efficiency have led to strong profitability, as shown in Nokia’s Q2 results published on July 18, 2013. 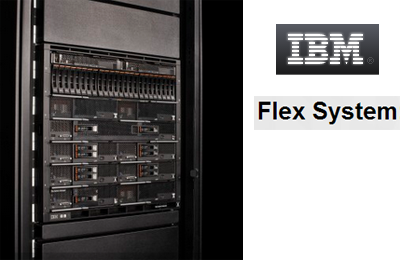 IBM unveiled a number of major additions to its Flex System portfolio, combining the latest server technology with new virtualization, networking and management tools. IBM said its goal with the product launch is to help clients use smaller data center environments to quickly deploy, manage and secure increasingly larger clouds. New switches and fabrics that help enable Software Defined Networks (SDN) and improve connectivity and performance by increasing infrastructure bandwidth up to 40Gb. Additionally, IBM has upgraded the Flex System Manager so that clients can monitor and manage up to 5,000 infrastructure end points and do so from any location utilizing iOS, Android and Blackberry mobile devices. LG unveiled its new flagship smartphone -- the G2, featuring a 5.2-inch Full HD display, energy efficient graphic RAM (GRAM) technology and a unique design that places all buttons on the rear of the device. 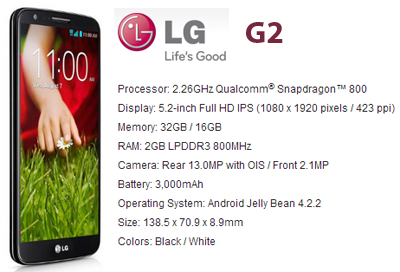 The LG G2 runs the Qualcomm Snapdragon 800 Processor with 2GB of RAM and support for LTE-Advanced. The LG G2's 13 megapixel camera offers Optical Image Stabilizer (OIS) technology and multi-point autofocus. Answer Me — Automatically answers the call after lowering the ringtone when the phone is raised to one's ear. Slide Aside — Enables easier multitasking by simply "sliding" open apps off to the side using a three-finger swipe. Guest Mode — Protects owner's privacy by displaying only pre-selected apps when guests access the phone with a secondary unlock pattern. The LG G2 will be rolled out in over 130 wireless carriers in the next eight weeks. 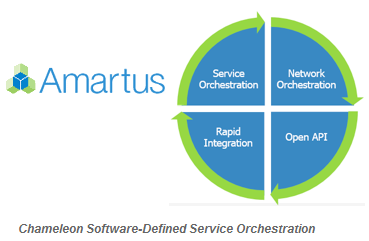 Amartus, a developer of automated service delivery software based in Dublin, Ireland, introduced its Chameleon software-defined service orchestration (SDS) solution for on-demand network services. Amartus said its Chameleon SDS software is designed to support rapid rollout, provisioning and operation of network services over existing networks (Carrier Ethernet, IP-MPLS and optical), and future SDN and NFV networks. The goal is to help service providers turn up new services in a matter of minutes. Service features include service design, discovery, provisioning, inventory, assurance and OAM. Network features include network discovery, inventory, performance, fault and configuration. API features include support of open standards for easy integration with existing northbound systems, partner systems and network aware application. Chameleon SDS is now available for trials or implementation. 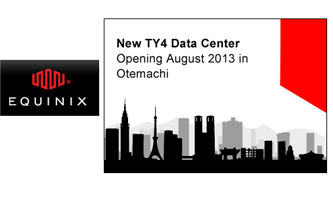 Equinix has opened of its fourth International Business Exchange (IBX) data center in Japan, located in Ōtemachi, Tokyo. The new data center has a total capacity of 750 cabinet equivalents with 450 cabinets available in the first phase. Equinix said the facility is an earthquake-resistant building in one of the most secure locations in Tokyo with multiple anti-disaster measures. In addition, TY4 has direct fiber connectivity to Equinix's three other IBX data centers in the city via the Equinix Metro Connect, a service that provides reliable network connectivity, allowing customers in TY4 to easily expand their business within the Equinix platform. The company is investing $43 million in TY4. In addition, Equinix recently announced plans to develop its first IBX in Osaka (OS1), as well as build its third Singapore data center (SG3). In addition, the company expanded into Indonesia in May 2013 in partnership with PT Data Center Infrastructure Indonesia (PT DCI), announced its plan to launch the fifth phase of its SG2 data center and completed the second phase of its fifth IBX facility in Shanghai. 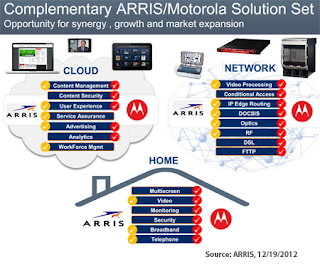 Arris completed its previously announced acquisition of Motorola Home. 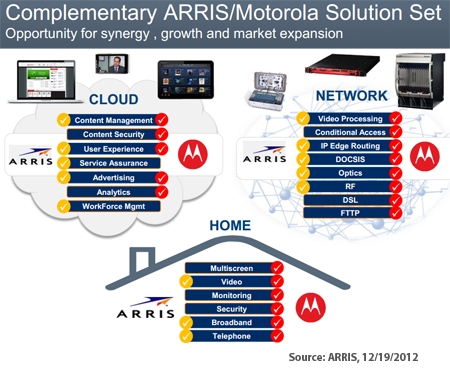 Arris also announced Q2 revenue of $1,000.4 million. The company estimates that prior to the close of the acquisition, Motorola Home recorded approximately $66 million of revenue in the second quarter. GAAP net loss in the second quarter 2013 was $(0.37) per diluted share, as compared to second quarter 2012 GAAP net income of $0.13 per diluted share and first quarter 2013 GAAP net loss of $(0.13) per diluted share. Year to date, GAAP net loss was $(0.52) per diluted share in 2013 as compared to GAAP net income of $0.18 per diluted share in 2012. A reconciliation of adjusted net income to GAAP net income per diluted share is attached to this release and also can be found on the Company's website (www.arrisi.com). "I am very pleased with our second quarter and first half results. The industry continues to react positively to our Motorola Home acquisition. Our integration plans are well on their way and ahead of schedule," said Bob Stanzione, ARRIS Chairman and CEO. "I am encouraged by the progress we are making in delivering new products to our customers and by an improving business climate." $4.0 million in orders from two new European mobile operators, including a Tier 1 operator, and including an expansion order from an Asian Tier 1 mobile operator. Procera said that by deploying its PacketLogic Intelligent Policy Enforcement (IPE) systems, these three mobile operators can leverage fine-grained, subscriber-aware analytics and advanced policy-based control to monetize their LTE investments and maintain their subscriber's quality of service and experience. Most of the revenue from these orders was recognized in the second quarter of 2013.
a Tier 1 service provider in Western Europe has awarded Procera a multi-million dollar expansion order. This customer previously selected the PacketLogic PL20000 following extensive competitive product evaluation and testing that included many stand-alone and integrated competitors. Procera expects to recognize the revenue from this follow-on order in the third and fourth quarters of 2013. Procera's PL20000 is designed to deliver fully personalized services in a policy enforcement configuration on a massive scale. It offers support for up to 320 Gbps of throughput configurable per platform, multi-system performance scaling to 5 Tbps, and the capacity to handle up to ten million subscribers and 120 million active flows. Tata Communications has chosen Procera's PacketLogic Intelligent Policy Enforcement (IPE) systems to enhance its mobile network operator (MNO) managed services portfolio. Tata Communications' Hosted Policy Engine (HPE) is a management and enforcement platform which offers customers reduced complexity, costs and time for deployment and ongoing operations. The hosted implementation provides a pre-integrated best-of-breed policy control infrastructure solution on a "pay for consumption" basis. The platform enables service providers to granularly manage and monetise subscriber and application traffic across heterogeneous packet networks including CDMA, GSM, LTE, WiFi, and fixed broadband. The Service Provider Core Router market will see an uptick in growth in 2014 and 2015 as service providers upgrade Internet backbone networks with recently-introduced core routers, according to a newly published report by Dell’Oro Group. The report predicts the new core router technology will drive the Service Provider Core Router market to near double-digit growth over each of the next three years, rebounding from the 10 percent decline in 2012. “We also expect core routers and new high-capacity edge routers to be deployed into numerous metro area networks to accommodate localized traffic loads,” said Alam Tamboli, Business Analyst at Dell’Oro Group. “Service providers will continue to increase purchases of these routers as they extend their backbone networks closer to end users to handle regional traffic,” added Tamboli.